First, We will explain the difference of detection principle between the optical cartridge and MM / MC cartridge. 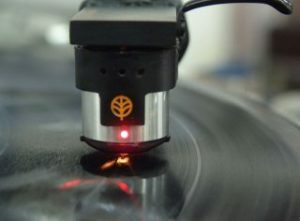 Both the MM / MC cartridge and the optical cartridge read the record groove through the needle, but the usual MM / MC cartridge detects the music signal by vibrating the magnet (or coil) in the magnetic field. On the other hand, optical cartridges detect music signals by capturing shadow changes (brightness changes) using LEDs and PD (photo cells). Because MM / MC cartridges generate electricity by cutting off the magnetic field, magnetic resistance always occurs when the magnet (or coil) moves. However, the optical cartridge detects only the change in brightness (shadow movement), so no magnetic resistance is generated when the vibration system moves. Since there is no magnetic resistance applied to the vibration system, the tip of the needle can move smoothly. To detect music signals, the MM / MC cartridge must move the magnet or the core and the coil. However, in the case of optical cartridges, it is only necessary to move a light shading plate with a thickness of only 100 microns, so the moving mass is very low. 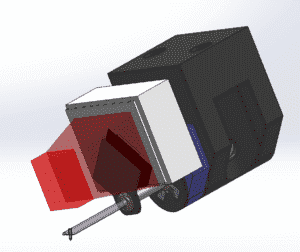 The optical cartridge detects movement of the needle using infrared LED, light shielding plate and two PD (photo cells). The operating principle is simple, the shading plate vibrates in front of the LED, and the PD (photo cells) behind it detects the change in brightness. The photo on the right is a view of the light shielding plate and the photo cells from the position where the LED is located. Since the shading plate vibrates in such a way as to block the light of the front LED, the brightness entering PD (photo cells) changes continuously from bright → dark → bright → dark. The movement of the shielding plate will be read as 2 separate stereo channels, by 2 independent photo detectors. The angular movement of the shielding plate ensures that each photo detector can only pick up information from its corresponding channel. Information from the parallel movement of the opposite channel will not be read, ensuring accurate channel balance and channel separation. ※Since the brightness of the photo cell does not change because the motion of the light shielding plate becomes a parallel movement on the side of the reverse PD (photo cells) side, it is possible to detect audio signals of the left and right channels with one light shielding plate. The important point here is that the output of the PD (photo cell) is the Pure analog sound because the movement of the shading plate = the motion of the record board is output as a voltage change. It is NOT Digital Sound. ② The standard RIAA equalization curve required for MM/MC is completely different from equalization required for optical cartridges. Because the output of an MM / MC cartridge is proportional to its speed, the output increases as the speed rises (= higher frequency). 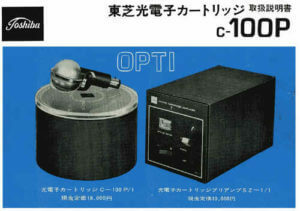 However, the optical cartridge has an amplitude proportional output that outputs flat from the low frequency to the high frequency (same as the old crystal type and capacitor type). Since the optical cartridge is classified as amplitude proportional and is not affected by changes in speed, even on the same record, it has totally different output properties. Much less EQ correction is required for the amplitude proportional output compared to traditional MM / MC. Because of this, the RIAA correction circuit of the optical cartridge requires much less manipulation of the signal compared to a speed proportional type MM / MC cartridge. In addition to that, there was one problem that could not be overcome in the past optical cartridges by any means. That is a problem of “Heat”. Forty years ago, LED technology was not well developed, and the only light source available for an optical cartridge was a standard style bulb. These bulbs generated a large amount of heat, which warmed the damper rubber of the cartridge, softening it over time and changing the compliance characteristics. Each company took various measures to overcome this issue, but optical cartridges disappeared from the market before a fundamental solution could be found. Even with this drawback, the sheer quality of the sound of optical cartridges gave the technology a legendary status for over 40 years. 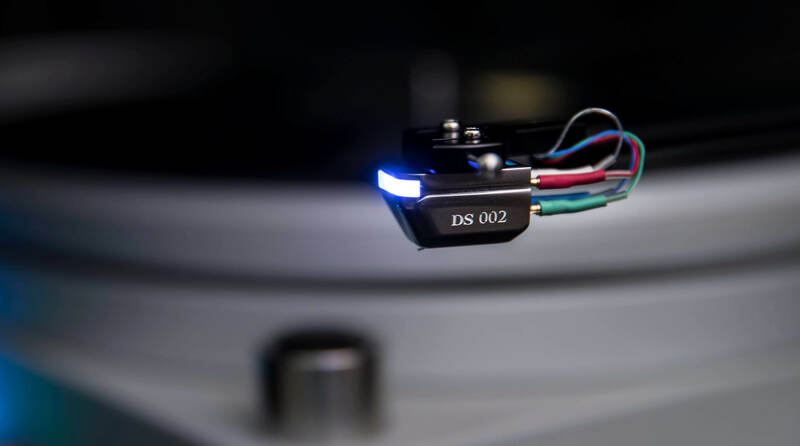 The biggest reason why DS Audio was able to successfully bring the optical cartridge back after 40 years is that technologies have evolved for both the light source and for the light detector. Today the problem of “Heat” is not an issue, because very small and high power LED can be used. Unlike traditional incandescent or fluorescent bulbs, LEDs do not generate heat. And since it uses a highly sensitive photodiode with its sensitivity characteristics well matched to the wavelength of the light source, it is possible to achieve a very high output. The optical cartridge has about 40 mV output, which is about 10 to 100 times higher than MM / MC cartridges, so high output can be obtained from an extremely low mass system. 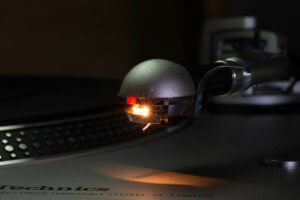 This is an advantage over MM / MC systems which require a very low voltage to pass through the tonearm wires, becoming vulnerable to interference and signal loss. The high output of the DS Audio cartridge is much more robust and less sensitive to interference. We invite you to experience the sound of this legendary technology, finally realized to its fullest potential.